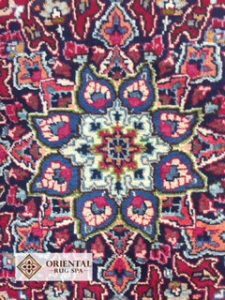 Oriental Rug Spa offer a specialist Persian, Oriental and Contemporary rug cleaning in Upper Hale. We also offer a rug repair service. If you own a dirty or soiled rug that needs professional cleaning, then why not give us a call on 01276 423150. You can drop the rug into our wash facility or arrange a time for us to collect from you. Persian Sabzevar rugs are usually tighly woven using wool on a cotton foundation. The wool has a high copper content which creates a very high quality hard wearing and lustrous yarn. The rugs are similar and influenced in design with Kashan and Mashad rugs. The weaving town of Sazevar is situated on the silk route between Tehran and Mashad. They are curvilinear in design using persian knot, incorporating floral patterns with a central medallion. Occasionally silk will be added to the finer carpets.